The body of the brown recluse spider (BRS) is light tan to dark brown in color. It is about 1/2″ to 1/4 ” in size.The males are usually smaller than females. 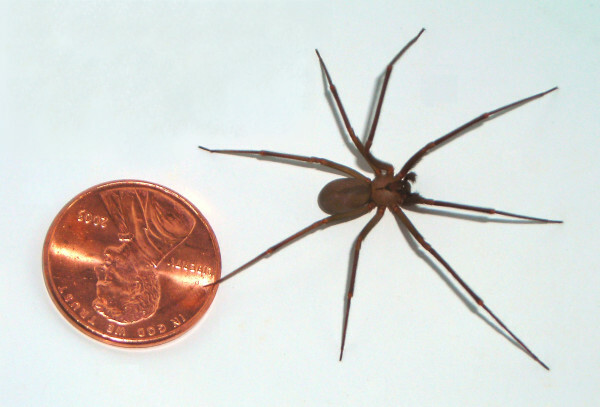 The body of the brown recluse spider (BRS) is light tan to dark brown in color. It is about 1/2″ to 1/4 ” in size. The males are usually smaller than the females. With leg span included, the BRS is about the size of a half dollar. The legs are long, thins and delicate. They have only six eyes. The most distinguishing mark is the violin like dark patch on their head with the skinny part of violin pointing toward the abdomen. The BRS can be found in the south central states including Texas, Louisiana, Missouri, New Mexico, Alabama, and Oklahoma. In the home, the BRS seeks secluded areas: around the hot water heater, in closets, under beds and furniture. Around the home, they can be found under the porch, in a woodpile, and in the garage. The BRS has a lifespan that ranges from two to 10 years. Females lay eggs from May to August. It takes a month for the eggs to hatch. The spider can tolerate temps from near freezing to over 100 degree. To prevent spiders and other insects from entering your home seal up all cracks and crevices which may allow entry. These usually occur around doors, windows, and pipes. Screens can be placed over dryer vents and other large openings. Keep closets and other areas as clean as possible. Vacuum around and under furniture and baseboards. Keep beds and linens away from the wall and off the floor. Shake clothing that has been lying on the floor. Wash clothing and bedding that has not been used for a while or that has been in storage. Poison has little effect on spider because they do not clean themselves or taste with their feet like many bugs do. This is not to say that it won’t help but don’t rely on sprays to keep spiders out. For large infestation a bug bomb, may be your best bet to reach the spiders you cannot see or reach with sprays. Once you have sealed up and cleaned house there are other methods to get rid of the spiders in your home. There are some dust products that cause insects to dehydrate and die. There are also glue traps that simply trap the spider and it can then be thrown away. These are a good way to monitor what insects may be in your house. If you are going to use a poison check with your local nursery or hardware store for what to use in your area. Always use caution when using pest control products and follow the directions and warnings.